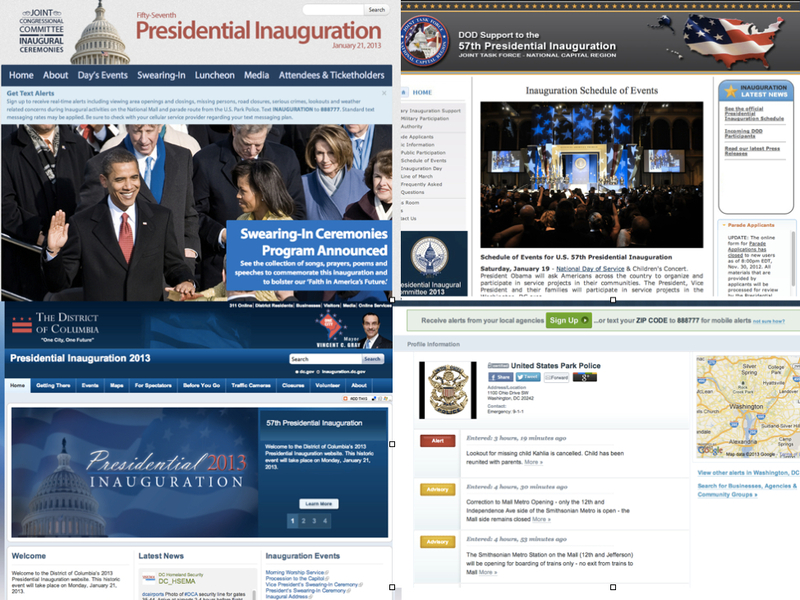 I really enjoyed participating yesterday in a Presidential Inauguration 2013 social media monitoring exercise. This came about because of a conversation between colleagues during our weekly twitter #smemchat. A few of us discussed the possibility of monitoring social media during the inauguration, then set up a Skype chat room and invited all who wanted to participate to join us there to discuss what we’d like to do. We set up monitoring tools and saved all official social media accounts related to the inaugural event and important websites to one handy document so that the monitoring team could share and have access to them. In that same document (called a “workbook” when we use it for official activations), we also shared our contact info and logged major actions taken, as well as things that we noticed were happening during the event on social media. We kept in touch about what we were seeing in the Skype chat room (via text chat). We looked for problems, then tried to share that information to help people find it via twitter. 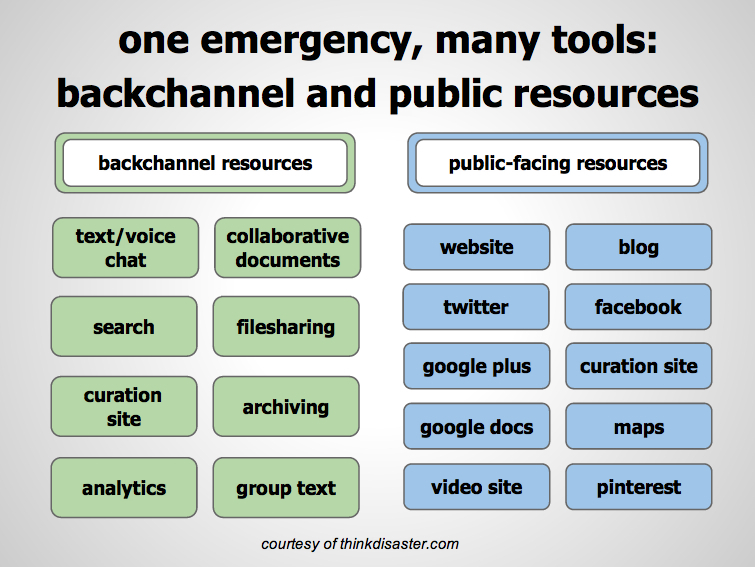 If we had an official agency to work with we could have done more, been more focused and perhaps been more effective, but even without that, we still got to test the tools and practice, which is always good, since new tools are available all of the time, and platforms change the way they work constantly. Practice is essential for maintaining good social media monitoring skills. Even more important than the social media tools is the outreach and team-building, and getting to work with people to establish a relationship and build trust. 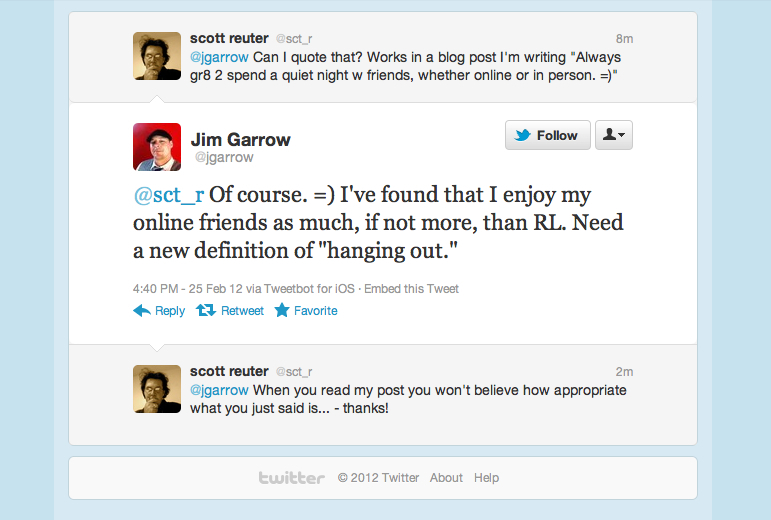 This is essential to working together via social media (as it is with almost any group). During this event I got to work with some people that I knew through casual conversations on social media, but had not yet gotten to work with. This was my favorite part of the exercise. Mostly the day seemed to go well, and while there were predictable traffic issues and a few children briefly separated from parents, it was overall a relatively calm day (I’m sure in large part due to the amount of behind-the scenes work of all public safety employees – the scanner was ful of activity!) from the point of view of the general public. We had two locals and three non-locals working on our effort, so we had access to live scanner info, and local knowledge of the region for those of us not so familiar with DC. We also monitored the official United States Park Police text alerts and amplified the text alerts to twitter on the two most active event hashtags, which were #inaug2103 and #inauguration. We could see what was happening via television radio, public safety scanner channels and what people – ost of people – were reporting via social media. What we didn’t have this time was a connection to an official agency should we find anything that needed to be addressed, or to get direction from as far as what to look for in the social media stream. This potentially would have made the exercise more realistic form the VOST viewpoint, since an actual VOST activation would always have an official agency contact. We didn’t have an official agency to work with for this one, so this was not a “Virtual Operations Support Team” (VOST) effort, but we used the VOST tools and procedures in a more informal type of operation just for practice. Even as an informal exercise, all practice is good. So while it was not an “official VOST effort”, many who were not familiar with the way VOST operates got to practice, experiment and learn to work together in a low-pressure setting. Everyone that helped enjoyed themselves and said they’d like to do it again. We may even do another training exercise during the superbowl, and try to get more people to participate. 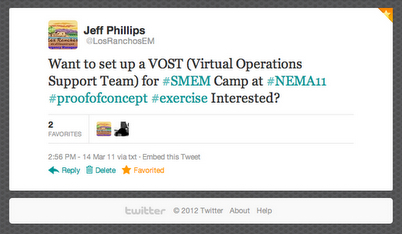 (Post a tweet to the #SMEM hashtag if you’re interested and we can discuss it). Major cultural and sporting events and the like are great opportunities to train using social media. The number of posts and tweets are simply overwhelming, so it’s great training for searching for useful and important information in the midst of chaos; just like in a disaster. There’s no simulation tool that yet exists that can provide such a realistic demonstration of what you face when trying to monitor social media during a disaster. My friend and colleague Cheryl Bledsoe of Clark Regional Emergency Services wrote a great post last year after we did a similar impromptu training exercise during the superbowl, describing what this is like. Have a look at that if you have time, as well as the rest or the SM4EM.org website; it’s a great resource. Thanks to all who participated, from Chris Tarantino (@Tarantino4me), Keith Robertory (@krobertory) and Donna Lee Nardo (@DonnaLeeNardo) and Wayne Blankenship Jr (@WayneDBJr) who first mentioned and supported the idea during #smemchat, to Marlita Reddy-Hjelmfelt (ATheRedElm) who helped to select an appropriate version of a VOST-style workbook with which to practice, to Mary Jo Flynn (@MaryJoFly), Caroline Molivadas (@disastermapper) and Karen (@surfingchaos) who worked extremely long shifts, and others like Mackenzie Kelly (@MKelly007) and Joanna Lane (@ joannalane) who were busy yesterday, but still stopped in to say hello, see how it was going, and discuss what we were doing. Good learning also comes just from discussing the work as you do it, so that’s helpful too. I built this how-to guide and list earlier today as a collaborative document, (link below) and I hope that others may still wish to add to the effort. • select the amount of columns and layout for columns in your search, then add searches. • you can also save the searches that you make. After you set up your searches, click on “ Full Address” in the menu at the top of the window, then copy the full address out of the URL (web address) window in your browser. Save this search for later use, or share with other. twitter can also be searched by latitude/longitude, from the center of the lat/long out, the smallest search possible is .1km, and the largest saerch possible is 2500km. 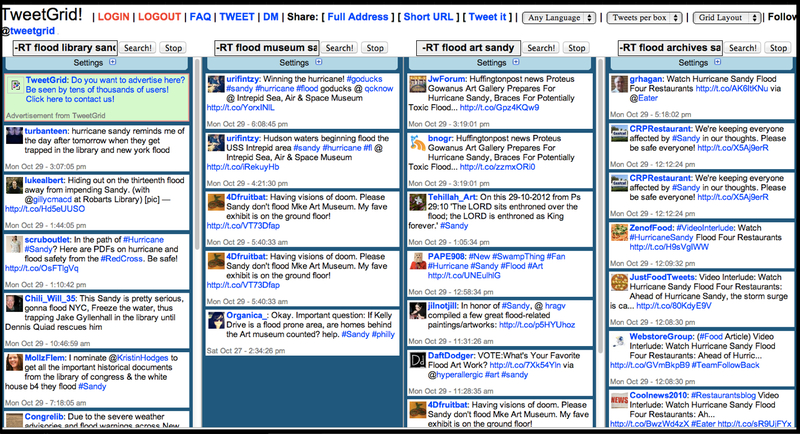 Over the course of the last year and a half I’ve gotten heavily involved in efforts to use social media in disasters. The friendships that have developed are real, and are now a part of my life, just as much so as other friends, family, and people in the local communities in which I participate. As you can imagine, working on a disaster in any phase is something that one must take seriously. The response phase can be especially stressful, even when you’re working the disaster from hundreds of miles away in front of a computer. Searching through fast running waterfalls of tweets, status updates, blog posts and news stories for useful, accurate and timely data then sharing it to the appropriate map, curated stream or wiki works better when you’re coordinating the effort with a group. That’s why groups such as Crisis Commons, Humanity Road, Crisis Mappers, Tweak the Tweet and Standby Task Force exist. There’s simply too much data to sift through yorself – you need to work with a group. Even though I still use it, I’m annoyed by the word “virtual” in reference to the disaster work that we do. It’s very real and important work, and I know it’s just a word, but that doesn’t make it any less annoying that we refer to it as that. And don’t even get me started on IRL, or “In Real Life”. I recall a few weeks ago in our VOST chat group that someone said they were soon going to meet another of our group “In Real Life”, which reminded me that there were many people in our group who I still only know by text and video chat, by email and by our “virtual” work together. It annoys me that the people – people who I consider friends – people that I work with in difficult situations, complain and laugh with in social media – are tagged as “virtual” communities. They are not virtual by my understanding of the word. I’m proud to be working with them, whether they live within driving distance or not. If you’re lucky, (or if you plan for it as Jeff Phillips did in out VOST group), your social media groups will want to talk and develop relationships outside of disaster activations. Thanks for working with me, my very real SMEM and VOST friends; my life is richer by “virtue” of knowing you.